Darren Clarke prepared his bid for a $1.2 million payday in the Nedbank Challenge in Sun City and beamed: I feel right at home here. But Padraig Harrington is not flavour of the month at Gary Player Country Club after turning down his invitation late in the day. 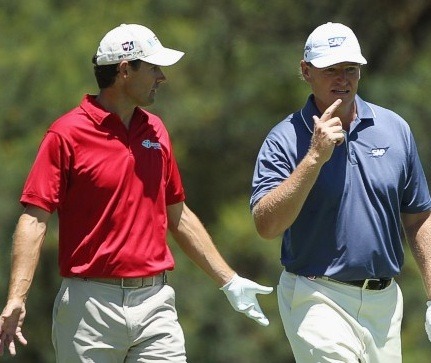 As Clarke lines up with world number four Retief Goosen in the first round, organisers are still annoyed that Harrington took so long to say no to the megabucks 12-man invitational. The Dubliner had tentatively planned to play in Sun City or Hong Kong this week but ended up heading to POLAND to work on his fitness instead. And his decision has not gone down well in South Africa after it cost the organisers the chance to land US Open champion Michael Campbell. Tournament director Alastair Roper said: “Obviously we would have liked to host someone like Campbell. As it is, he would have liked to have taken part. However Padraig Harrington kept us waiting. “By the time Harrington declined the invitation (mid October), Campbell had already decided to take part in another tournament. Defending champion Goosen is the top ranked player in the field at number four in the world while Ernie Els, ranked fifth, is using the event to mark his return to action after a 20 weeks on the sidelines with a knee injury. Sergio Garcia (6th), Jim Furyk (7th), Adam Scott (8th), Chris DiMarco (9th) and Kenny Perry (10th) are the other members of the top ten taking part with Cink, Clarke (19th), Angel Cabrera (11th) Luke Donald (15th) and Tim Clark (21st) completing the elite field. Clarke is delighted to be in Sun City, where he finished third in 1999, 11th in 2000 and 2001, and fourth on his last appearance in 2003. He said: “I got here on Monday and I just love it over here. I always feel at home here and I’ve been down to Pinnacle Point to have a look at my new course design. Clarke is also a massive fan of the venue for this week’s event - the Gary Player Country Club. He said: “I’m always happy to be in Sun City. It’s such a fantastic venue and the golf course is one of the best we play on all year. “I have to say I’m really looking forward to it and hopefully I can make a few birdies and round off the year with another win. Clarke has been drawn with tournament favourite Goosen for the first round with the returning Els paired with Furyk. Els has not played since the Open at St Andrews in July after undergoing knee surgery following a yachting accident. And the Big Easy admits he will be nervous before he tees it up in one of his favourite events. He said: “I actually feel pretty nervous about playing again. I've spoken to a few guys who had a similar experience to me, with not being able to play because of injury. “They all said the same thing. When you come back, there's that extra element of the unknown, which we're not used to. But nerves aren't a bad thing. “I feel good and my knee feels good today. It wasn’t so good over the weekend but I’m icing it and I want to play well and make my return. 10.10 Darren Clarke (N Ire), Retief Goosen (SA). 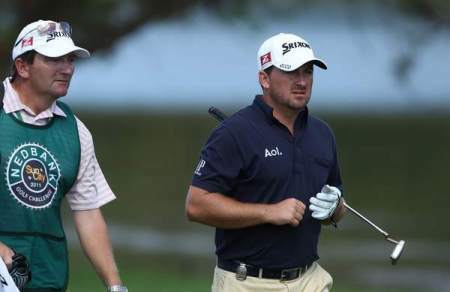 Graeme McDowell shot a two under 70 in the first round of the Nedbank Golf Challenge. Picture golffile.ie/Luke Walker/golfsupportGraeme McDowell shrugged off a wayward day with the driver to shoot a two under 70 and trail defending champion Lee Westwood and Masters winner Charl Schwartzel by just two shots after the opening round of the $5m Nedbank Golf Challenge in Sun City. Graeme McDowell with caddie Ken Comboy during the second round of the $5m Nedbank Golf Challenge. Picture golffile.ie/Luke Walker/golffupportPadraig Harrington hasn’t worked with him long enough to feel the benefit but Graeme McDowell can vouch for Pete Cowen’s credentials as the best “fixer” in the game after snatching the halfway lead in the Nedbank Golf Challenge.